Our scans are captured with the Betterlight 8K large format or the Phase One P45 medium format digital backs coupled with strobe or Northgate HID lighting. 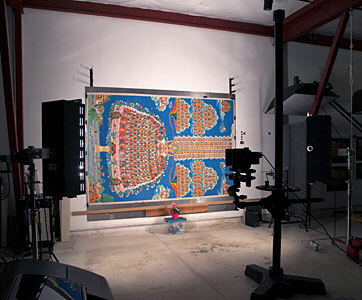 Smaller artwork is scanned on our Creo Eversmart Supreme flatbed high resolution scanner. We custom color profile every capture resulting in incredibly sharp, crystal clear, color accurate scans with native resolution sizes exceeding 1 gigabyte possible. This means that we can print full 60" wide prints directly from our highest resolution scans with no need for enlarging! Includes scan, CD and jpg file. Ideal for promo cards, catalogue reproductions, internet and email. Includes scan, CD, jpg and 1 proof. Perfect for most full size reproductions and prints. Includes scan, CD, jpg and 2 proofs. For full size and larger prints and when cropping sections. Large installation or cropping small sections for large prints? This is the ultimate scan.